G+H Akoestiek is one of the leading companies in the technical acoustics industry. The experts of G+H have the best solution for any noise problem. For instance, G+H Akoestiek optimises the work environment and minimises the nuisance to the environment. Regardless of whether this concerns industrial companies, power plants, non-residential construction, hospitality or, for example, traffic. Through years of experience, extensive expertise and advanced test and measurement facilities, customers are assured of watertight noise guarantees. 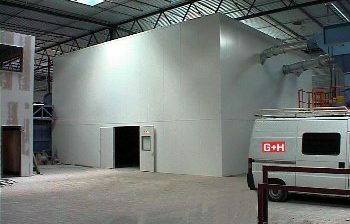 Among other things, G+H Akoestiek provides soundproofing enclosures, acoustic screens, silencers, vibration isolators, noise-reduction panels, doors, personnel cabins and low-reflection areas. G+H Akoestiek can perform any noise control project turn-key, from acoustic and engineering design, engineering and production, to delivery and assembly. Needs and requirements are translated into expert tailor-made advice. Over the years, G+H Akoestiek has developed innovative products and cost-effective solutions for many noise problems that meet the highest quality standards. The large production capacity ensures quick delivery, with mass production resulting in a very competitive price / quality ratio. The production process of G+H is NEN-ISO 9001 certified.